but don't deal directly with saves. Includes GP1, WCX, finding data for PKM etc. A rudimentary viewer and editor program for GP1 files. Supports drag and drop (just drag the GP1 onto the program). Has a function to store location data, as well as use stored location data. The bundled location.txt needs to be in the same folder as the program, for it to work. Also has in-built CP calculator, based on IVs and level. Note: the CP shown, is based on PGo CP calculation, which is how Go Park works. Initial encounter, it will show PGo details. Once captured, the CP gets rerolled to Let's Go CP. If you're rehosting it, please link/source THIS page. On this day, some of the stats of certain Pokemon has been changed. (4) you received the Pokemon from trade after the change. Meaning if you already had the creature before the change, it's CP and stats will remain unchanged on Pokemon Go, until you performed one of the points above. Do note that these changes could be enforced in the future, even if the actions specified above wasn't performed. [Confirmed on my end; I transferred 2 Meltan on 13-Dec, one captured before and one captured after the change. As Gen 7 for 3DS has come to an end, I'm slightly more comfortable releasing this. 3. Do not contribute faked/edited events IN ANY WAY to us. I randomly stuck random code together to create this editor, in part due to solving a user's problem. AFAIK the viewing portion works, haven't really tried making anything, but in theory it should work. 3. Do not contribute faked events made to us. The original legality checker @Sabresite made a long time ago! While it hasn't been updated in a long time, it is important to archive such tools! This will be a RNG Tool for all main Pokémon games generations 3-7. It currently supports parts of generation 3. This is a program that can generate TID-SID pairs, find PID, that's tied to IV, Gender, Nature. Also provides the frame for emulator use, for tool-assisted RNG. Original RNGReporter dev team for creating RNGReporter. Credits to amab for all the Channel Jirachi logic and Pokespot RNG. Credits to Zari for the 16-bit seed to time logic, GameCube RNG searching logic, Pokespot RNG, and generally other advice. Credits to Kaphotics for PID to IVs (aka Find Frame) logic and Pokespot RNG. Credits to CollectorTogami for TogamiCalc. This tool is effectively an RNG reporter for XD Colo Pokemon, and the dropdown box allows users to search for specific species. Converts a pkm/3gpkm file to any of the forward generation formats, depending on what the user selects. I've made a mini program that'll dump WC7FULL files that are held in RAM. While the program can show up to 10 entries, I've programmed it to dump up to 25 entries. This program has drag&drop support! This program is a mass editor for every Pokémon file you can open or create with PKHeX, so that you don't have to do it for several Pokémon manually. Note: Downloads section mirror, will be replaced if the original developer uploads to the downloads page. 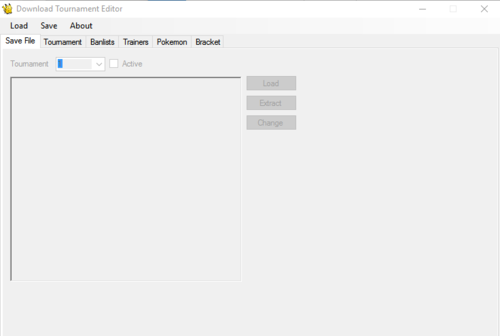 Description: Tool to edit downloadable Pokemon World Tournaments in Gen 5.